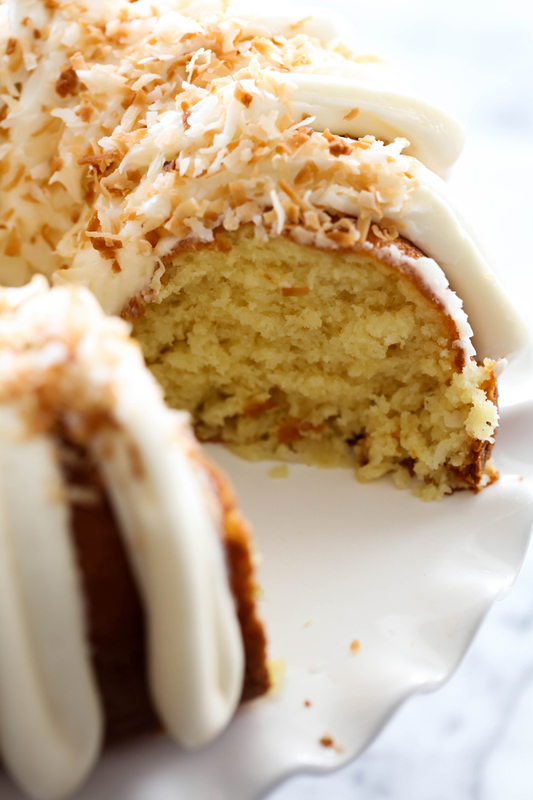 This is an incredibly moist cake loaded with coconut flavor! The Cream Cheese Frosting on top is the perfect pairing. This cake with be loved by all who try it! Coconut happens to be a favorite in my family. It is a weakness for both my mom and dad, particularly my dad. Any dessert with coconut in it has him running to the kitchen. Even the smell of it is enough to make us all go weak in the knees. 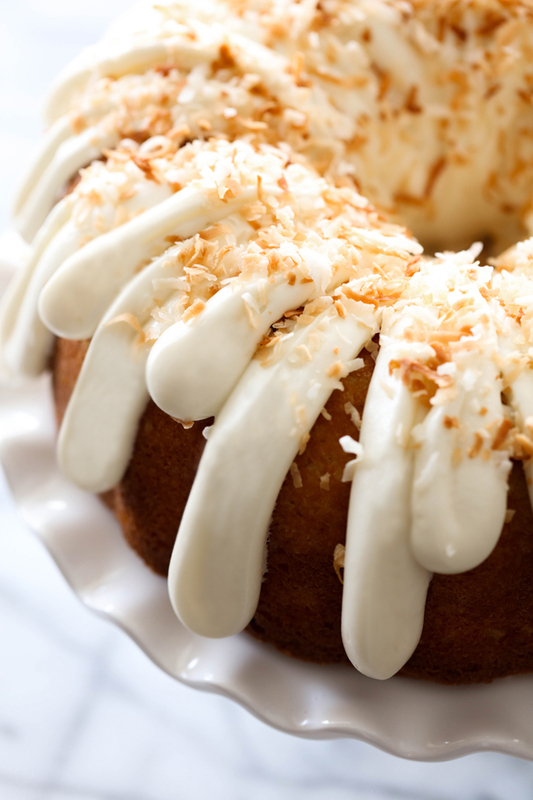 I knew I had to take my favorite bundt cake recipe and adapt it to have that coconut flavor and the end result was extraordinary! This cake will be one of THE moistest cakes you ever have the pleasure of trying. The cream cheese frosting is the perfect complement to it. This was the first dessert gone at the gathering I took it to and everyone had the highest praises about it. This will definitely be a recipe I make time and time again. I know you will love it just as much as we do! Grease and flour a bundt pan and set aside. In a large mixing bowl, combine cake mix, pudding, eggs, sour cream, sugar, oil, water and coconut extract and beat for three minutes. Stir in the coconut. Pour into a bundt pan that has been greased and floured. Cool in pan on a rack for 15 minutes. Then remove from pan and cool completely. Combine all ingredients in a mixing bowl and beat on high until smooth. Spoon frosting into a piping bag and pipe the frosting over the top. Good morning, This cake looks amazing. I do have one question...When you say coconut, do you mean sweetened coconut? Bundts are so fun to make! How did you get those perfect icing petals?? Hi. 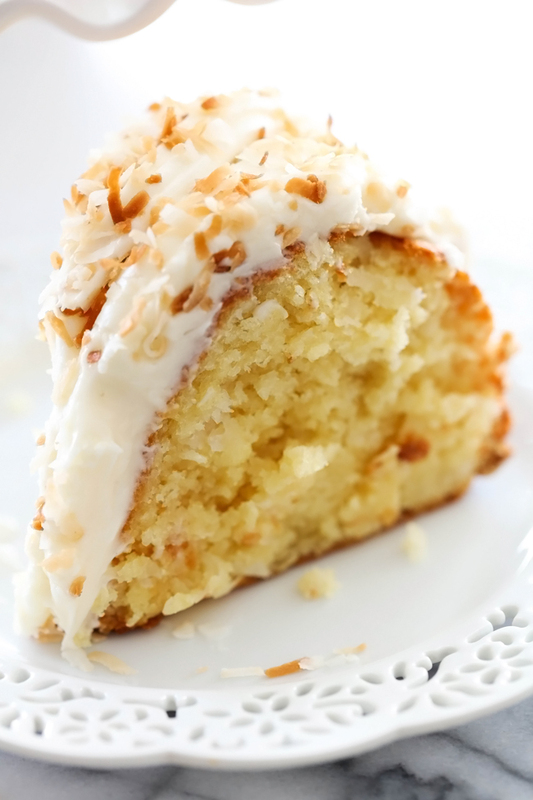 I looove coconut and this cake looks amazing! I noticed the Cream Cheese frosting recipe does not have any butter? Please confirm. Thank you! I love coconut and this looks so delicious!! Can you please tell us what tip you used to pipe the frosting with? I went crazy just on the look of it as it seems so scrumptious and mouthwatering cake to have it on my first Bite. Congratulations for such an excellent recipe, must say you are genius. Made this and it was amazing! I left out the added sugar, and after tasting it, it definitely didn't need it. I also didn't frost it, it was perfectly delicious with just a dust of powdered sugar. My family all agreed this is their favorite new cake. Thank you! Did you use sweetened coconut or unsweetened? Text from my father in law after i placed the left over cake from a friends bridal shower on the counter... "Ok..ok...Kara left 2 , 1/2 cakes on our counter....I have not eaten cake this good in years!! She can stay forever as long as she does things like that. =-D"
Thank you for this incredible recipe!! I made it last night but its not what i expected? I think i buy wrong vanilla pudding, i dont know cox i pick small box its says 136g, it really taste good but its looks like a pie cake. Not a bundt cake. When still in the oven, the whole pan is full but when i open the oven it shrink half size. Why its like that? Make sure you use INSTANT vanilla pudding!! This cake sounds amazing. May I ask the gram (box) size of the ready cake mix and vanilla pudding mixes. Im from SA and want to make sure im using the correct ratios. May i know the size of the bundt pan? Made this for a coworker's birthday. It was a hit! Very moist and the icing was perfect with it! Can't find my bundt pan ? Can I use the batter to make cupcakes? What other pan shape will work?? I made this today and it was a hit with my family. So moist and delicious. I did use coconut extract in the frosting opposed to the vanilla extract. I would like to make this as a 9x13 sheet cake instead of a bundt. How would that change the recipe or the cooking time? This cake was absolutely delicious! The only change I made was by using coconut dry pudding mix instead of vanilla. My husband said I could make this cake for every occasion! Can you freeze this bunch cake? I would like to make two of them. If you use white cake mix, why is it yellow? The Vanilla pudding makes it yellow!!! Hi, I was wondering if I could make this cake 1 day before or is just better to make it that same day. This recipe sounds amazing! What do you mean sweetened coconut? Is it coconut flakes? Or coconut milk? People read the recipe. It says sweetened coconut. And did someone really ask where do you buy cake mix and instant pudding? Ha! Obviously you aren't a cook or you have never grocery shopped. Oh well!! Happy baking. Or, the recipe didn't originally say "sweetened" at the time the questions were asked and maybe questions about where to purchase certain ingredients were asked by people not here in the U.S. and those ingredients aren't well known and/or available there. I think a couple of posts make it obvious that there are visitors here from all over the WORLD Wide Web. And I plan on making this tomorrow...can't wait to taste it! I hope subbing coconut oil for the oil will be okay. Made it this morning and just had a slice. It is sooooo delicious! I had to do 3 substitutions because of what I had on hand and/or personal taste: used coconut oil, coconut cream pudding mix, and chocolate buttercream icing (that was personal taste...I needed chocolate today). The cake itself is so moist and flavorful, and with the chocolate icing, it makes all my coconut-chocolate dreams come true (and I have A LOT of those). Thanks for such a tasty and easy recipe. I'll try the cream cheese icing the next time I make this because there will definitely be a next time. Thank you so much for the wonderful recipe. I just made a second cake! My 81 year old father said it's the best cake he's ever had. Thank you again! I make this all the time it has become my husband's favorite cake. I use coconut water instead of plain water and I use coconut cream instant pudding instead of vanilla. This is a fantastic cake! So easy to make with such delicious results. I did cut the added sugar in half (used 1/4 cup) and used 1/2 almond, 1/2 coconut extract. Definitely going in the keeper file! hi'what is white cake mix?is it all purpose flour if yes how much? This cake is absolutely delicious! I divided it and made 12 cup cakes and 11 x 7 cake. Ended up freezing half of the cake and had it the other day and it was just as moist and delicious as the day it was made! It tastes like a cake you get at a bakery or fine restaurant. This was very good, even without the frosting. I did not have instant pudding(3oz) box, only the cook&serve(4.6oz/130g)box, i added it dry to dry cake mix(15.25oz/432g)box and stirred with whisk to blend, then i added wet ingriedients and beat, came out perfect, not dry and it did rise like any other bundt cake. My new favorite cake, thank you for this wonderful recipe! The most delicious and moist cake I’ve ever tasted! I’ve made this cake twice (in two different ovens) and I cannot figure out why the cake breaks coming out of the pan every time! I’m greasing, I’m flouring, I’m also ruining it. LOL. HELP! I have made this cake twice I Love IT.. This cake is so moist and keeps well. I never eat the baked goods i make, but this one i did try and it was amazingly delicious! A crowd pleaser for sure. Hi .. Can I use Coconut cake mix instead White cake mix!!?? thank u fr the recipe! Please tell me the size of tip you use for icing petals on Cake. Looks marvellous. believe it or not its not a tip. I just put the frosting in a zip lock back and snip a corner and just pipe it on with that. Absoluteky the BEST — I’m doing my fourth in just six weeks - this one today is a gift!!!! I even bought a cake box and cardboard insert and a doily! Very professional looking . Everyone LOVES this cake!!! This recipe has become a family favorite and the #1 Choice for a birthday dessert. It is moist and ever so good. I love it! I made this cake today, absolutely delicious! This cake is perfection! I have made this recipe at least 10 times because everyone loves it. I made the recipe as is every time. It is super moist and delicious. The coconut flavor is very subtle so if you want more of it, I would recommend using coconut cream pudding instead of vanilla and using coconut extract in the frosting instead of the vanilla. I load on the toasted coconut on top and it's always a hit. Makes my kitchen smell amazing!!! Instead of vanilla pudding I used coconut cream instant pudding. Omitted the coconut extract and also omitted 1/2 c sugar. I didn't feel it was needed. Holy mother of God. This is an amazing cake. I did not use the added sugar as another person stated. It does not need it what so ever. Just simply amazing no frosting just a little powdered sugar. Thank you so much for this recipe. Love love it. I just made this cake and all I can is WOW, love it so much more than the Barefoot Contessa’s coconut cake. Made for a dinner at church, huge success!!! Delicious!!! Can a box of coconut cream instant pudding dry mix be used instead of vanilla? I have made the ding ding cake and just made the coconut cake. Ive never used a Bundt pan until I came across these recipes. My new way to make cakes. Why have a boring round cake when you can have a beautiful Bundt cake. I have a few different pans and they have different designs. I love when I flip them out and see how beautiful they are. For this recipe I added a 1/4 tsp. Of almond extract to the cake mix and to the frosting. I added a 1/4 tsp of vanilla extract to the cake mix. I didn't have the coconut extract. It was delicious!!! Thanks for the recipes. I can't wait to make all of them. The ding ding cake is everyones favorite!! !